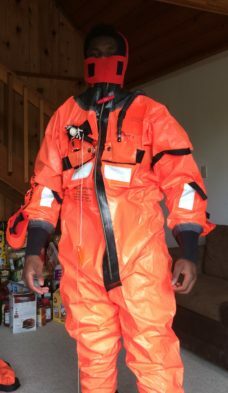 Inspired by Seahawk Thomas Rawls, a young African-American man from Flint took a job fishing in Alaska’s Bristol Bay, and it paid for his first year in college. Plucked from the harshness of Flint, MI., and delivered to the pristine waters of Alaska’s Bristol Bay, upon one of world’s greatest fisheries, Jawanza Brown had his mind close to blown. From the hometown of Seahawks RB Thomas Rawls, Brown, 18, was the beneficiary of the highly developed social conscience of a salmon-fishing boat operator from Bellingham. 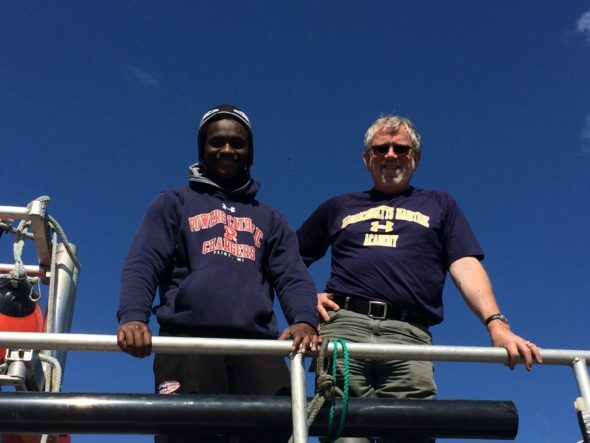 Brown is now a debt-free freshman at Michigan’s Saginaw Valley State University because he was unafraid to seize the 18-hour days over six weeks to help harvest the Pacific Ocean’s summer bounty. 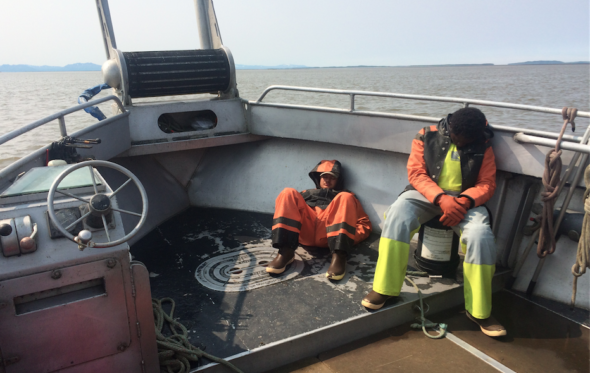 Six weeks of numbing labor and little sleep aboard a 32-foot gillnetter with a four-member crew of strangers was the kind of springboard that seems to be vanishing from the American economy: A difficult, rewarding summer job that makes college accessible to ambitious kids from impoverished backgrounds. 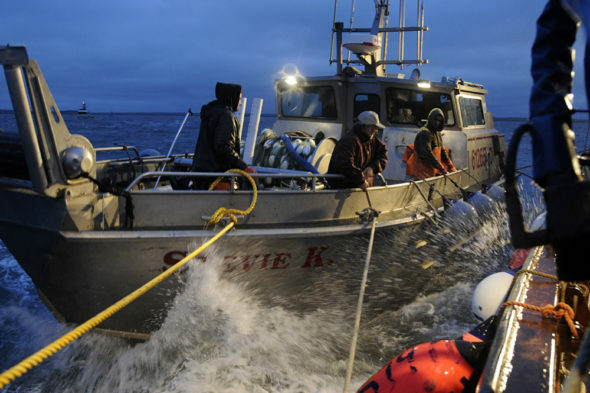 Cool enough to make the experience the first of four summers for him aboard the Stevie K, one in the fleet of more than 1,000 licensed commercial vessels that this summer feasted on a near-record run of 56 million sockeye salmon, well over a typical run of 40 million. On July 3, Alaska Fish & Game recorded a milestone: More than one million fish caught by the fleet in a single day. Brown, one of six children of a single mother who’s a hairdresser, will be back next summer because Gibbons has three requirements for healthy crew candidates out of high school: A commitment to attend college for four years, a commitment to rejoin him at Bristol Bay each summer, and a good attitude. Brown said he checked all three boxes. “I kinda miss it,” he said. Words no one around this story might never have imagined him saying. To summarize: Gibbons, a Washington State University grad, for years has hired with good success graduating seniors from mostly white Sehome High School. Then he was inspired by a 2016 Seattle Times story that profiled Rawls and his beleaguered hometown, site of a national scandal over water quality. Driven by a desire, he said, to put young people “in the front seat instead of the back seat,” Gibbons inquired among school administrators in Seattle and Tacoma for guidance in finding an African American kid willing and able to take the risk for the reward. Stymied by skepticism, he reached out to Rawls’ agent, then went directly to the Boys & Girls Club in Flint, where Rawls and Brown, years apart, spent much of their youth. After overcoming the who-is-this-guy scrutiny, Gibbons induced club leaders and coaches to vet young men that fit his requirements. Brown, a good student and football player, was said to be an easy choice, but Gibbons had to see for himself. He flew to Flint, bringing boat gear for instruction and questions to illuminate Brown’s character. Satisfied he had his guy, Gibbons set up the first plane flight in Brown’s life. 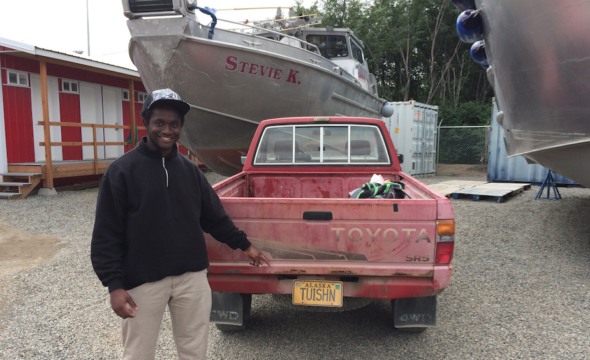 Two days after his June graduation from Flint’s Powers Catholic High School, he went from Detroit to Seattle to Anchorage to Naknek, headquarters town for the fleet. Then came immersion in life on another planet, starting with two weeks on shore loading the boat with supplies and gear, and testing the systems. While on shore, Brown came into contact with people in Gibbons’ world: Rival boat captains and crews, suppliers, contractors and full-time residents, all of whom basically have an annual reunion before the fish return to the five major river districts on the Alaska Peninsula. Asked what was the most surprising thing about his experience, Brown said a surprising thing. “The hospitality,” he said. “I was just a guy from the whole other side of the continent. They don’t know me, I don’t know them. They all accepted me with a lot of respect. They made me comfortable. I wasn’t expecting any of that. Once the boat launched, the crew, if all went well, would not touch land for six weeks. Brown immediately passed the first test: Not once was he seasick. Didn’t even know what it was. “Your body’s going to go through changes in a new environment, and new stresses,” he said. “But I said, ‘Well, just have to deal with it.’ Hauling in the fish, bleeding them, dealing with the nets . . . it’s kinda tiring. Seasickness was not a problem. Homesickness was different. “I got very homesick,” he said. “It wasn’t very pleasant; sometimes I’d think, ‘I really wish I could be home right now. I miss my family and friends, everybody who supported me.’ On the boat, they knew it. But I didn’t want to show it. I just wanted to stay positive. Brown shared the boat with two Gibbons veterans: Evan Villalobos, a former Sehome wrestler who paid his way through Northern Arizona University with four Bristol Bay tours, and Paul Pacini, a Marine veteran who takes time off his regular job as a Skagit County deputy sheriff to head north when Gibbons needs a strong senior eminence. The crew got on well. But not everything was smooth with Brown. Almost inevitably, he hit the figurative wall. Mid-season, a film crew from ESPN came aboard for a couple of days to document Brown’s remarkable experience. After they departed, Gibbons spotted a letdown. “I don’t want to put it on playing to the cameras, or anything like that,” he said. “But after the ESPN crew left the boat, we were on an 18-hour schedule, and he just got really slow. I couldn’t stand by. I knew he had more energy than what he was giving us. He was impeding the progress of what we had to get done before bed. I had enough. So when we got into the anchorage, I shut down the boat and went out on deck, and in front of the crew as well as a boat beside us, I let him have it. “In no uncertain terms: The last fish is just as important as the first fish. We have to have the same sense of urgency every day, every hour. If we’re up until 3 a.m., no one’s going to get any sleep. “I remember Buck telling me everybody can have a bad day, but we have to ask ourselves, why are we here?” he said. “We all want to be here, and we are a crew. And I chose to be there. We had a responsibility to each other. As with most athletes, high school, college or pro, Brown needed a shot of honest, constructive criticism. He returned in August from Bristol Bay and began college classes in Saginaw, an hour north of Flint, a changed person. “I was relieved to think I’d done my job and did good,” he said. “And I was kinda sorry to see it end. It’s growing into what it’s like to be a man. I don’t have to worry about next month’s rent, or depend on someone else. I can do it myself. Gibbons has seen it before. His young crew members “get a little confidence, a little swagger. He’s going to come back next summer to a little pay raise, a little more responsibility toward the boat. Brown’s remarkable summer required leaps of faith from many besides himself: His parents and family, the Flint Boys and Girls Club, Gibbons and his crew. That it worked once means it can be done again. Gibbons sees the gap between good summer jobs in Alaska, where crew members as well as workers in shore-side fish processing plants, are needed, and the many bored, broke youth in inner cities who would respond as Brown did to a chance to pay for college without incurring debt. In several ways, it’s better and easier than a full-ride sports scholarship. “I’m concerned some people will think I’m in this for some brokerage fee, or to be an employment agency,” he said. “That’s not what I’m doing. I’m just trying to bring people together because I think there’s a win on both ends of it. And Brown learned he’s on only one planet, a big place that works better than he thought. Imagine the disruption if others made the same discovery. Excellent column Art. Robbie Tobeck would enjoy this. Thanks Art! Nice to see the follow-up article. Glad it worked out for the kid. The world can be really good with people like Buck Gibbons stepping up! Please help spread the word that employers can do small things that make a big difference. Good article, Art. In the lower pic it looks like they’re being towed in. Four people working on a 32 foot gill netter, I understand why Buck chewed him out; like a football team, to avoid injury everybody has to trust the person next to them and do their job at a high level . . . Better ingredients, better journalism. Treat yourself to some Papa John’s Art. Better? When wasn’t it good? Or did you let politics get in the way? Papa Johns…who wont let ANY employee work long enough to qualify for health insurance. although you did make a good point about better journalism Paul, maybe we can treat ourselves to Papa Art’s? Great story Art! Unsung heroes in this story and countless others…..the Boys & Girls Clubs. Thanks for this story, Art, and congratulations to Buck, Jawanza and the entire crew for a successful season. I did not see the Stevie K this past season (different fishing districts) but I did hear one of Jawanza’s radio interviews broadcast on the local Bristol Bay radio station. Sounds like an energetic and engaging young man. And, I was surprised to hear your radio sportscast on that same radio station. Can’t recall the date, but the main subject of your report was the remarkable career of Sue Bird. Always great to hear you on the radio, especially so far away from Seattle.